Kscope 17 is approaching fast!!! And we’ll be there! Hi guys how are you? We are sorry for being away for so much time but this year we have a lot of exiting things going one, then let’s start with what we’ll be doing at Kscope 17! In order to have a performatic Essbase cube, we must keep vigilance and follow up its growth and its data movements so we can distribute caches and adjust the database parameters accordingly. But this is a very difficult task to achieve, since Essbase statistics are not temporal and only tell you the cube statistics is in that specific time frame. This session will present how ODI can be used to create a historical statistical DW containing Essbase cube’s information and how to identify trends and patterns, giving us the ability for programmatically tune our Essbase databases automatically. EPM environments are generally supported by a Data Warehouse; however, we often see that those DWs are not optimized for the EPM tools. During the years, we have witnessed that modeling a DW thinking about the EPM tools may greatly increase the overall architecture performance. The most common situation found in several projects is that the people who develop the data warehouse do not have a great knowledge about EPM tools and vice-versa. This may create a big gap between those two concepts which may severally impact performance. This session will show a lot of techniques to model the right Data Warehouse for EPM tools. We will discuss how to improve performance using partitioned tables, create hierarchical queries with “Connect by Prior”, the correct way to use multi-period tables for block data load using Pivot/Unpivot and more. And if you want to go ever further, we will show you how to leverage all those techniques using ODI, which will create the perfect mix to perform any process between your DW and EPM environments. These presentations you can expect a lot of technical content, some very good tips and some very good ideas to improve your EPM environment! Also I’ll be graduating in this year leadership program and this year we’ll be all over the place with the K-Team, a special team created to make the newcomers fell more welcome and help them to get the most of the kscope. Also Rodrigo will be at Tuesday Lunch and Learn for the EPM Data Integration track on Cibolo 2/3/4. And of course we will be around having fun an gathering new ideas for the next year!!! And the last but not least, this year we’ll have a friend of us making his first appearance at Kscope with the presentation OBIEE Going Global! Getting Ready for More Than +140k Users (Jun 26, 2017, Monday Session 4 , 3:15 pm – 4:15 pm). A standard Oracle Business Intelligence (OBIEE) reporting application can hold more or less 1,200 users. This may be a reasonable number of users for the majority of the companies out there, but what happens when an IT leader like Dell decides to acquire another IT giant like EMC and all of their combined 140,000-plus users need to have access to an HR OBIEE instance? What does that setup looks like? What kind of architecture do we need to have to support those users in a fast and reliable way? This session shows the complexity of Dell’s OBIEE environment, describing all processes and steps performed to create such environment, meeting the most varied needs from business demands and L2 support, always aiming to improve environment stability. This architecture relies on a range of different technologies to support that huge amount of end users such as LDAP & SSL, Kerberos, SSO, SSL, BigIP, Shared Folders using NAS, Weblogic running into a cluster within #4 application servers. If the challenge was not hard enough already, all of this setup also needed to consider Dell’s legacy OBIEE upgrade from v11.1.1.6.9 to v11.1.1.7.160119, so we will explain what were the pain points, considerations and orchestration needed to do all of this in parallel. Thank you guys and see you there! Hi guys how are you? Today we are proud to announce that we are making available the ODI KMs for HFM 11.1.2.4. We developed these KMs around 6 months ago, but we were waiting to release them together with an article that we wrote for Oracle. Since OTN had some “Priority changes”, our article was postponed to later this year. As we had some people asking for these KMs we decide to release the KMs now and when the article is published we will let you guys know as well. The article is live here! And if you guys are having errors with our KMs, please check our troubleshooting post here. Prior to version 11.1.2.4, ODI could be easily used for HFM integration processes. ODI used its KMs with specific HFM drivers (HFMDriver.dll) provided by Oracle that were used to access and manipulate HFM applications. However, on HFM’s latest version, Oracle decided to remove its support for ODI, meaning that all HFM integrations would have to move from ODI to either manual iteration with HFM, usage of another integration tool (Like FDMEE) or create custom code using the new Java HFM API. Since we didn’t want to re-write all our ODI environment and also none of the above options are robust enough, we decided to recreate the ODI KMs using Java HFM API. For these KMs to work we need to do two things: import them from ODI Java Net and do some setup in the ODI agent. In the article we explain all options and how do we came up with this solution, but here we will not talk about it since we want you guys to read our article as well and we can’t use the content of the article here since we already signed an exclusivity agreement with Oracle. Install the agent in the HFM machine OR copy the necessary jar files to the agent drivers folder (oracledi\agent\drivers). If you decide to go with the second option, we’ll provide a list of all the necessary jars (be prepared… it’s huge). In the article we explain how to identify all the necessary jar files in a systematic way but here this is not an option as explained before. 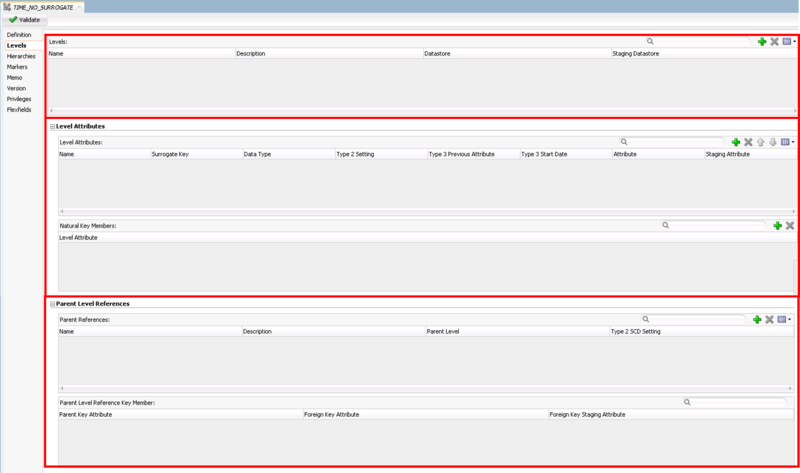 Search for all the Jars in the below list and copy all of them under oracledi\agent\drivers folder. Restart the ODI agent and it should be ready to execute any HFM Java code inside of ODI. I know that this is a lot of jars and will take some time to find all of them but at least you’ll be able to upgrade you HFM and still use the same interfaces you have today in ODI to manage HFM (just remember to use the new data store objects reversed from the new RKM). The KM usage is very similar to the old ones and we had the instructions in all its options so we’ll not explain then here (just in the article). The only important difference is on how to setup the “Cluster (Data Server)” information on Data Server (Physical Architecture). For the new HFM API, we need to inform two new settings: Oracle Home and Oracle Instance Paths. Those paths are related to the server where your HFM application is installed. These settings will be used internally in HFM API to figure out all HFM information related to that specific HFM instance. Due to these two new settings and in order to continue to accommodate all connection information within a single place (ODI Topology), “Cluster (Data Server)” was overloaded to receive three settings instead of just one, separating them by colon. So now “Cluster (Data Server)” receives “dataServerName:oracleHomePath:oracleInstancePath” instead of just dataServerName. Having those considerations in mind, it is just a matter to create a new Data Server and set the overloaded “Cluster (Data Server)” information and the user/password that ODI will use to access the HFM application. After that, we just need to create a Physical Schema with the name of the HFM application, a new Logical Schema and associate that to a context. And that is it, you guys are ready to upgrade your HFM environment and still use your old ODI interface to maintain HFM. If you guys have any doubts/suggestions about the KMs please few free to contact us. If you guys are having errors with our KMs, please check our troubleshooting post here. I hope you guys enjoy these KMs. See you soon! Hi guys how are you? Today I want to share our new OTN article Building a 100% Cloud Solution with Oracle Data Integrator. The article will cover how to integrate BICS, PBCS, DBCS and ODI and will explain step by step how to create a 100% cloud solution using ODI (everything on the cloud including ODI :)). This is a perfect article for companies that are thinking to go cloud and have some doubts or even are thinking how you can integrate/use your actual infrastructure with the cloud services. I hope you guys enjoy and see you soon. Today we’ll continue the dimension and cubes series (Part 1, Part2 and Part 3 here) and we’ll see how to load data using Surrogate keys. After all the setting done in the last post, now the only thing left is to create the interfaces and map everything. For the Surrogate keys, the interface and the mapping are exactly the same as for no-surrogate version (as we can see in the previous posts) for both, dimensions and facts, what’s very nice. The interesting here is what he does behind the scenes. In the no-surrogate version ODI created one mapping for each hierarchy and in the end it merged everything together inside a table. For the Surrogate key version, ODI also generates one mapping for each hierarchy but the main difference is that after each one he merges it witch the others. This happens because he needs to get the surrogate key for each level. For each level ODI automatically generates an insert into that level stage table verifying if all the columns does not exists in the target table (He does that to decrease the amount of data for the merge step since merge would insert or update everything and would take more time than necessary). After the stage table is loaded the next step is to merge the stage table to the target table, and for that ODI just create a “Merge”: when match he updates the descriptions or attributes and when doesn’t match it inserts the new rows with the sequences for the SK. In the next level of the hierarchy ODI repeats the process but joining the Year with the Quarter. ODI will keep doing this for each level mapped until the last one, where instead of having a merge with matches and not matches, he just do a merge with Matches (since he know everything will already be there). 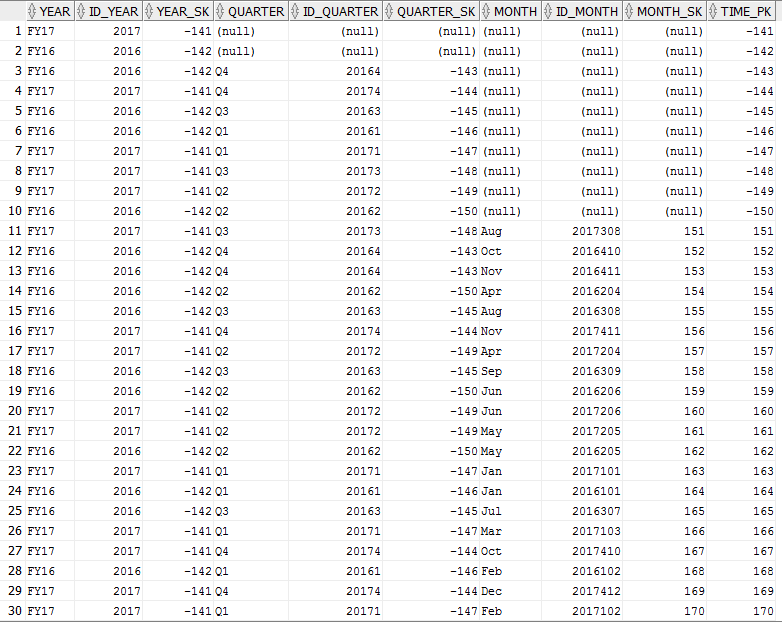 It’s nice that ODI already creates the dimension thinking in an aggregated fact since we can see that he has some rows just with the year, other with the year and quarters and the last one with all the information. One thing to notice is that the PK is the same as the Month SK. This is because ODI is ready to create SCD type 2 (we’ll do another post to show how it works). For the fact, the mapping will still be the same as the No-surrogate version and again the difference will be in the results. We can see that in the operator ODI does something really neat this time. A perfect DW created using surrogate key, in other words, instead of having the dimensions PKs in the fact table we have the SKs (that ware generated by a sequence in the dimensions). In resume, we think that if you going to create simple dimensions and simple facts (without surrogate key or SCD type 2) it’s still nice to use this new feature since it’s a nice way to document and standardize your DW, but if we measure by development time it’s not worthy since it’s very time consuming for simple DW. Now, if you want to create a DW using surrogate keys or SCD type 2 we found this new feature extremely useful for both, documentation and standardizations and because is a lot faster than do manually. Today we’ll talk a little bit about the new feature introduced in ODI 12.2.1.1.0, Dimension and Cubes! As everybody already know, Oracle is slowly merging OWB within ODI and in each release we can see a new feature from OWB arriving in ODI. This time were the Dimension and Cubes feature. This feature helps you to create a DW based in a configuration that you do. 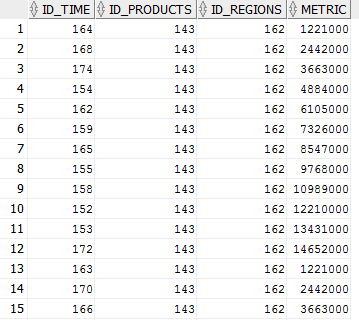 Basically there is a new component in ODI that helps you to define the datastore to be mapped. Also, after you create all dimensions (that is the most time consuming part in the process), the cube or fact table creation and mapping is a lot easier than do it manually. Right now there is just one type of dimension available (Star schema level based dimension), but in the future other kinds will be supported like snow flake and others. Ok, let’s start. There’re two ways to build a star dimension in ODI: with natural key’s (where the natural key is stored in the FACT table) and with surrogate keys (where the surrogate key is stored in the FACT table). In this post we’ll cover how we create a DW using the natural key process since the surrogate key one is buggy (the interface fails on saving the surrogate key) and we have openned a SR with Oracle to get it fixed. As soon we have the fix we’ll cover that too here in the blog. In the Designer tab we can now see that we have a new tab called Dimensions and Cubes. Opening that tab you will find a blank area, you need to click the button in the “Dimension and Cubes” tab, and you can create a new DM or DW. By the way, here’s the first small bug. For some reason when you write the name you want, ODI does not fill automatically the code field (as it always do for all the other objects in ODI), then you need to manually insert a code there. Remember, no spaces and no special character. After that we can expand it and see the Dimension and the Cube node. Right click on those and we can create a new Dimension or Cube. As everybody knows, the dimension comes first since we need them to maintain the data integrity of the cube. Here you can give any name you want for the dimension. Also you have a Pattern Name (that has just one option by now) and in the side tabs we have all possible options for the Dimension, Levels and Hierarchies, that we’ll cover later. There are two more option here: the Datastore, that is the target dimension datastore where all metadata will flow and the Surrogate key Sequence that you need to set in case you want to create a dim using surrogate key (We’ll cover this later since we have a bug here). Let’s create the Time dimension. Click in the “Levels” in the left side tabs and you will see a big screen in three big sessions: Levels, Levels Attributes and Parent Level References. Let’s begin with the level configuration. Clicking in the button will create a Level. I always like to rename the Level to something more meaningful like “Year” but if you like you can keep as default. By the default the target datastore comes automatically mapped since you define it in the previous screen. The only thing left here is to define the “Staging Datasore”. This is something that we didn’t understood why it was made in this way since ODI could create automatically based in the definitions we had in the previous step or even with the interface configuration. We can create another table exactly in the same way of the target table (needs to be a new table because the way ODI integrates the data. We’ll cover that latter). We can create, in this case, 3 tables, one for Year (same way as the source table is), and one for Quarter (same way of the source plus all columns from the Year table) and one for Month (same way of the source plus Quarter and Year columns). And we can duplicate the sources or the target datastore and do the changes above (in the 2 approach). For each attribute you need to and fill the name of the attribute, set the data type (yes it not get automatically….) and select the Stage attribute (click in the “…” button and select it). After all Attributes and ID’s we need to click in the below to set the natural key of that level. Just select in the list available. After that, we just need to repeat for all the other 2 levels that we’ll have in this dimension. With this done, the last step for this tab is to create the relationship between one level and its parent level. For this, highlight each level again, in this case we’ll start from bottom up, then let’s start clicking in the Month level and click on button below. Here we just need to say that for the Month level his reference parent will be Quarter. To set this we just need to select the Quarter level from the drop box and select eh foreign key from the drop box as well. Do that again for the Quarter level and reference it to the Year level. We don’t need to create any reference for the Year since it has no parent. As you can see, after the level configuration, everything you need to do is click in buttons and select from drop box or from “…” Screen (other than rename the defaults values if you like). For last but not least, we need to click in the tab Hierarchies on the left tabs to enable us create a new hierarchy. This is something fun. We can create multiple hierarchies inside the target table as well as skip level and some other features that we’ll cover in another post. For now let’s stay with a single hierarchy. Here we need just to create the hierarchy by clicking in the button, give a name for the hierarchy and then click in the plus button bellow and add all the levels for the hierarchy. The order doesn’t matter, the idea here is that you can have multiple hierarchies with different levels in each one. For example, we could have a hierarchy called Full_Time with Year->Quarter->Month and another Hierarchy called Small_Time with just Year->Month. ODI would know based in the configurations we did, how to handle the data. Nice. Also we can set skip level for each level we defined. We are done with the dimension settings. I know it’s a lot of settings and some of you could be thinking (as we thought, this is a lot more work than if I create manually), but believe me, after you get used, you can do it in a reasonable time and the cube part is worthy. To start the same thing as the dimension, Right click in the Cubes node and new. In this screen we need to give a name for the cube, select a pattern name (Same as Dimension, just one option here for now) and do a biding to the target datastore. After that we just need to click in the Detail tab in the left menu and start to configure our fact table. As I said in the beginning, here’s where the use of this components pays off. To configure a cube we just need click in the button and add all dimension we have, in this case our three dimensions. Then we just need to select the level we want to join our Fact table with our dimensions and bind the keys from the fact and that dimension. For the last but not the least we just need to create by the measures that the Fact table will have. Same as the attributes in the dimensions: Name of the measure, Datatype and the column that will receive the data. And that’s it. We are all set to move to the Mappings. Since this is already a huge post, I’ll stop this one now and will start a new post just for the Mappings, since I want to analyze how ODI builds the queries and loads the data there. Hope you guys enjoy this post and see you soon. PBCS, BICS, DBCS and ODI!!! Is that possible??? Hey guys, today I’ll talk a little bit about architecture, cloud architecture. I just finished a very exciting project in Brazil and I would like to share how we put everything together for a 100% cloud solution that includes PBCS, BICS, DBCS and ODI. Yes ODI and still 100% cloud. Now you would be thinking, how could be 100% cloud if ODI isn’t cloud yet? Well, it can be! This client doesn’t have a big IT infrastructure, in fact, almost all client’ databases are supported and hosted by providers, but still, the client has the rights to have a good forecast and BI tool with a strong ETL process behind it right? Thanks to the cloud solutions, we don’t need to worry about infrastructure anymore (or almost), the only problem is… ODI. We still don’t have a KM for cloud services, or a cloud version of ODI, them basically we can’t use ODI to integrate could tools…. PBCS: Basically we’ll work in the same way we would if it was just it. BICS: Same thing here, but instead of use the database that comes with BICS, we need to contract a DBCS as well and point the DW schema to it. DBCS: here’s the trick. Oracle’s DBCS is not else then a Linux machine hosted in a server. That means, we can install other things in the server, other things like ODI and VPN’s. ODI: we just need to install it in the same way we would do in an on premise environment, including the agent. VPN’s: the final touch, we just need to create VPN’s between the DBCS and the client DB’s, this way ODI will have access to everything it needs. Yes you read it right, we can install ODI in the DBCS, and that makes ODI a “cloud” solution. BICS: It’ll read directly from his DW schema in the DBCS. PBCS: There’re no direct integration between the PBCS and DBCS (where the ODI Agent is installed), but I found it a lot better and easy to integrate them using EPM Automate. EPM Automate: With EPM Automate we can do anything we want, extract data and metadata, load data and metadata, execute BR and more. For now the easiest way to go is create a script and call it from ODI, passing anything you need to it. VPN’s: For each server we need to integrate we’ll need one VPN created. 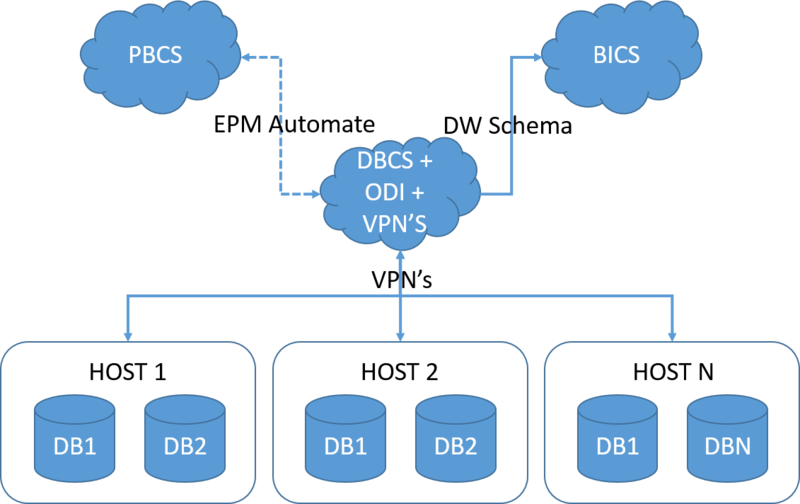 With the VPN between the DBCS and the hosts working, use ODI is extremely strait forward, we just need to create the topology as always, revert anything we need and work in the interfaces. And that’s it. With this design you can have everything in the cloud and still have your ODI behind scenes! By the way, you can exactly the same thing with ODI on premise and as a bonus you can get rid of all VPN’s. In another post I’ll give more detail about the integration between ODI and PBCS using EPM Automate, but I can say, it works extremely well and as far I know is a lot easier than FDMEE (at least for me).